My beautiful Leo is not well. Just before Xmas she had feever and no appetite at all, I took her to the doctor and put her under treatment and just as she showed she went better on new year's day she started not feeling well again. She lost her appetite again and in the beginning she was panting alot and drunk a lot of water but had no fever. The next day I noticed that her belly was bloated, I took her to the doctor again for blood tests (expecting the results today). The doctor fears that she may have an infection in her womb. She is generally very quiet, eats very little and drinks lots of water. I don't take her out for walks to avoid tiring her. This afternoon will also take her for x-rays to check for gastric torsion. You can't imagine how worried I am. 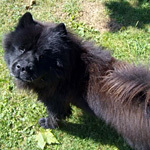 I don't know much about chows (or dogs in gereral, I always had cats) but I love my baby and really scared I might lose her. Could someone give some more advice? I feel quite lost. If you're not poor, get a second opinion from another doctor! It sounds like it is something serious and I would expect your doctor to spring into action and examine her immediately, maybe even keep her overnight until the problem is found! If it's bloat, it needs immediate treatment, if she needs an operation, it should be done as soon as possible! When you go to the vet today, insist on some answers or more exams!!! Good luck to your Leo! Sarahloo, indeed I thank you for your concern. My baby has purulent womb, the doctor kept her overnight. He is going to operate on her tomorrow. Let's pray everything will go well. I'm not familiar with purulent womb. What is it and how did it happen? Best wishes for Leo tomorrow. Please keep us updated. Oceans--purulent means infected and oozing pus. Sounds like pyometra. Which is quite serious, and they normally remove the uterus for it. I hope the surgery went well. Many thanks for your concern. The surgery went fine. However her womb was 5 pounds! But she is well now, still under medication though. I was so scared the other day. I do thank you for your support.